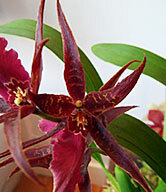 Spindly indian red blossoms clamber along this orchid's stem, their chocolate brown-tipped petals seemingly in motion even when perfectly still. This dynamic hybrid of Brassia and Miltonia provides an unusual accent that would look just as good in a Southwest-style setting as it would in an Asian-theme or Ikea Postmodern room. 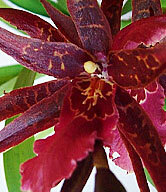 Best of all, we found Miltassia to have a pleasant scent, which adds to its delightfully edgy character. Our Mediterranean-inspired ceramic vase, ivory white with terra-cotta vertical lines, provides a perfect counterpoint. Own both of them now and enjoy! Plants are shipped in bud approximately 1 week before blooming. The buds will open gradually, growing more spectacular by the day for up to 4-5 weeks. This way, you get to enjoy the full blooming stage of this magnificent plant--only from Beautiful Orchids. 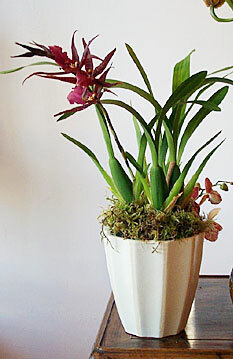 From base line to top petals, the orchid stands at approximately 14-20 inches tall. The blooms (7-9 buds) measure 4.3 inches in lenght.